Some writers start writing their books with a specific genre in mind. They set out to write a fantasy, or a romance, or a literary paranormal chick-lit novel. Going out on a limb, I would say that this is the vast majority of writers. Some writers, however, start writing their books for the sake of writing. They don't think about whether it's a thriller, or a mystery, or a romantic spec-fic. They just write, and see what comes out the other end. And this is where they run into problems. From the start, I knew that it was going to be difficult to determine which genre my novel, The Dreamon (which I finished two weeks ago! Woo-hoo! ), fits into. It just seemed to have so many elements of different genres, but not fit into any of them. The only thing I could be sure of is that it is YA, and, as any teen book aficionado will tell you, YA is not a genre -- it's an age range. PARANORMAL -- The Dreamon could be paranormal ... but maybe not. The Dreamon creature itself is actually just a manifestation of a person's consciousness, and not strictly a demon. Plus, when you think of Paranormal, you think vampires and werewolves, which this certainly isn't. Best move on. HORROR -- The Dreamon is pretty scary in parts, but it's probably not horror. The purpose of the book is not to scare people -- it's to entertain and encourage them. This one isn't right, either. FANTASY -- Yes, The Dreamon pretty much fits into the Fantasy genre. It has fantastical things in it, but these fantastical things are never fully explained (if they were fully explained, it would not be Fantasy -- it would be Sci-Fi or Paranormal, depending on the nature of the explanation). Okay, so Fantasy it is. But there are so many different subgenres of Fantasy -- Epic Fantasy, High Fantasy, Arthurian Fantasy, Fantasy of Manners, Bangsian Fantasy ... which one does it fit into? URBAN FANTASY -- This could be a fit. Urban fantasies are fantasies which are set in modern times. But urban fantasies are specifically set in a city, and The Dreamon is only set in a city for about a quarter of the book (and even then, sometimes it's a dream city ...). Best look for something else. PARANORMAL FANTASY -- Probably not, considering I've already established that The Dreamon is not paranormal. Besides, I'm not sure that Paranormal Fantasy is even a thing. PSYCHOLOGICAL FANTASY -- Okay, I think I just made up this genre. I did Google it, though, and somebody has made a Goodreads shelf titled "Psychological Fantasy". But none of the books on it look anything like The Dreamon. This genre is disqualified on account of its not being real. By this point, as you can imagine, I was ready to give up and just call it Fantasy. But then, I had a brainwave. The closest I had come to defining The Dreamon was urban fantasy. What if there was a subgenre of urban fantasy which would be a fit? So I Googled "Urban fantasy subgenres". 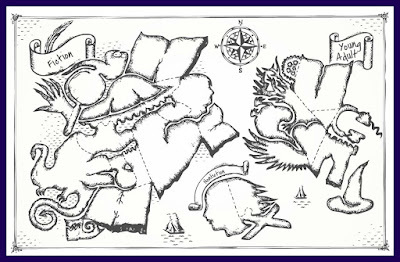 These terms [contemporary fantasy] are used to describe stories set in the putative real world (often referred to as consensus reality) in contemporary times, in which magic and magical creatures exist but are not commonly seen or understood as such, either living in the interstices of our world or leaking over from alternate worlds. Without giving too much away, this is perfect for The Dreamon. So when people ask, "What's your book's genre? ", I don't have to say, "Well, it's kind of psychological paranormal urban fantasy ... ish". I can say, "it's a contemporary fantasy." End of story. 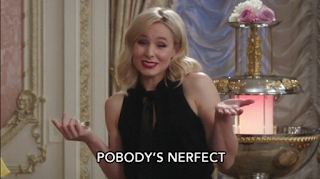 So, if you're struggling to figure out a book's genre, here's my advice. Explore all the possible options. If you find something that's a close fit, but not exact, see if there's a subgenre or a related genre that will fit. 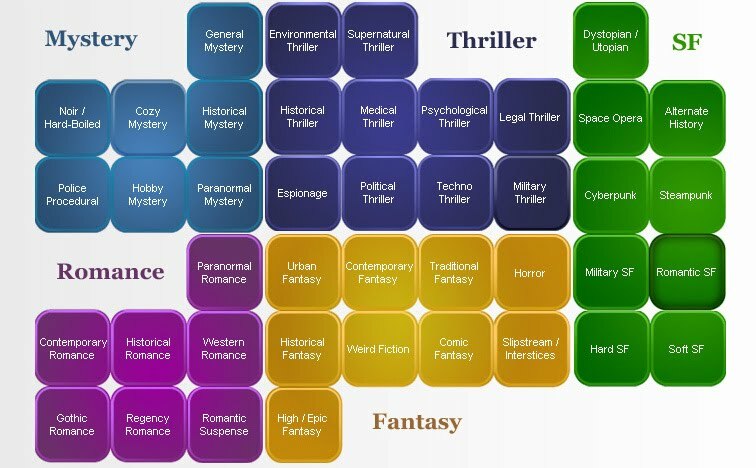 And don't forget, you could have a combination of genres, such as paranormal romance or science fantasy. It's just possible that nothing will fit, but the chances of that are pretty unlikely. Most everything can be classified. Also, quick tip -- if you've exhausted every possible genre under the sun, then just call it mainstream or literary. That's genre-speak for, "It's not sci-fi or romance or anything, it's just a book! Okay?" This is a cool genre map from Book Country. Click the picture to go to the full interactive map! There are so many genres, it can be hard to find the right label for a story. Thanks for sharing this. This is very helpful! I'm having the same issue with my book, Hidden Design. HD also fits into that "Contemporary Fantasy" genre. I'm definitely going to look into that! Glad I could help, Tia!